For people who already have their DNA sequenced with 23andMe or Ancestry, this powerful new product is available as an add-on to any InsideTracker blood test purchase. 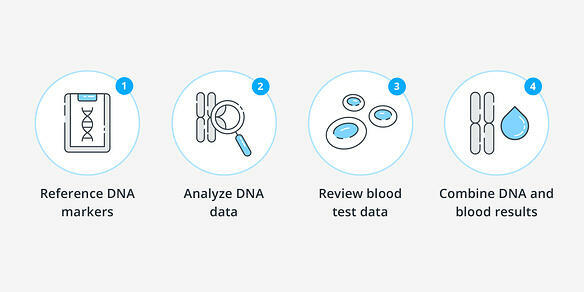 DNA+blood combines and compares your blood biomarker results with your DNA results to reveal your genetic potential for five areas of wellness: Weight, Sleep, Healthy Aging, Performance, Sensitivities. This is an incredibly powerful way to view your body’s inner workings and optimize your wellness. Why? Because while your genetic code remains unchanging, your genes are not your destiny. DNA can give you an indication of your body’s predisposition or potential for certain wellness traits such as sleep, weight, and aging, but in most cases, it’s how you interact with your environment that really drives the manifestation of your genetic potential. Your blood biomarkers, on the other hand, are constantly shifting in response to your nutrition, fitness, and lifestyle choices. Blood biomarkers paint a picture of your body’s response to your environment, and as any veteran InsideTracker user knows, that picture can be improved over time by following personalized nutrition and lifestyle recommendations. It's the personalization of these recommendations that gets even more precise when both blood and DNA are part of the analysis. Simply purchase any InsideTracker blood test and select the DNA add-on option. Follow the instructions to upload your DNA data. Voila! Once your blood test results are available, you will receive a personalized, downloadable DNA+blood report. It includes easy-to-read summary information on your genetic potential for the five main areas of wellness, and for the more science savvy, also includes detailed DNA data in the appendix. It doesn’t end there: Once you’ve uploaded your DNA data, you’ll receive a fresh new DNA+blood report each time you get a new InsideTracker blood test! Your DNA doesn't change, but your blood does, and this is a great way to compare your genetic potential to how your body is actually performing over time. How does it work on our side? First, our proprietary algorithm analyzes your DNA data, then reviews your blood test data, and ultimately combines your DNA and blood test results into an ultra-personalized story – neatly packaged and delivered in PDF format! Your personalized report will reveal your genetic potential for up to 22 different wellness and performance traits by analyzing up to 261 genetic markers and combining that information with your latest blood test results. The exact number of traits and number of markers analyzed will depend on when your DNA was sequenced by 23andMe or Ancestry (the short of it: early users of these platforms had their DNA sequenced on earlier-generation chips, which results in fewer markers available for analysis; more recent users have a greater number of markers available). Scores for traits: Your report will also combine multiple related genetic markers into “genetic scores” for certain wellness and performance traits, such as glucose, blood lipids, and athletic type (endurance vs. power, pictured below). In the case that your DNA data is missing certain genetic markers, InsideTracker will only provide genetic scores in cases where there are enough markers to do so (80% confidence). DNA-only traits: Some traits are based only on your genes, and do not include blood test data, such as athletic type and metabolism. As with all of our analyses, these results are based on rigorous analysis of peer-reviewed scientific literature. Blood biomarkers: Some genetic markers are paired with specific blood biomarkers, such as cholesterol levels and vitamin B12 (pictured below). In these cases, your report will reveal your most recent blood test result and compare it to your DNA. Review: Rigorous scientific analysis of over 1000 commonly researched genetic markers, using peer-reviewed research. Selection: From 1000 markers, we selected 261 genetic markers that are most strongly backed by research and relevant to the InsideTracker user population goals. Combination: We combined related genetic markers into proprietary genetic scores for traits such as athletic type and blood lipids (cholesterol). Customization: We used sophisticated data science to determine which genetic information could be applied to user DNA data from either 23andMe or Ancestry. At least one study and one replication study. A study must include a total of at least 1,000 subjects and no less than 100 subjects (larger sample size in studies is associated with more statistically significant results). 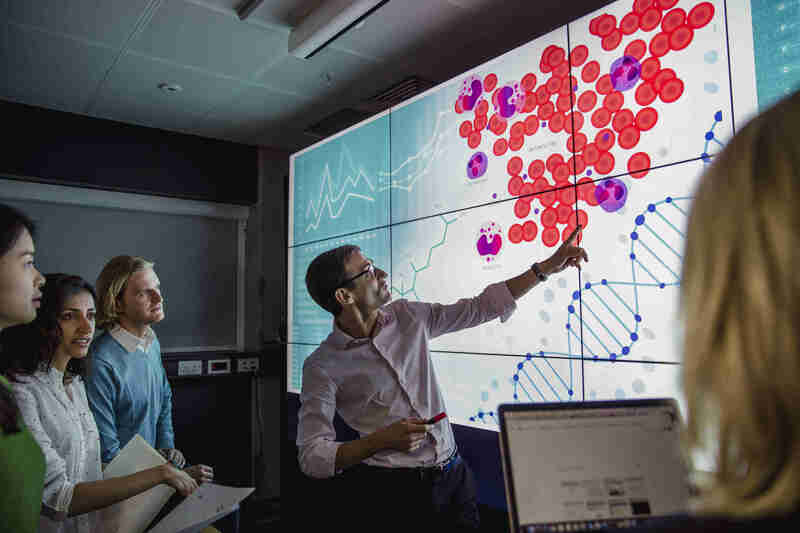 For many genetic markers, our science team reviewed strong GWAS (Genome-Wide Association Studies), which include thousands or hundreds of thousands of subjects. Want to learn more? Check out this blog post, where we dive into the science behind DNA+blood in much greater detail. In the meantime, feel free to contact our awesome team with any questions about how it all works – or head on over to the store and put your genetic data to work right away, by selecting the DNA add-on option to any blood test at checkout!